This is the way the summer begins: with a whimper. This is the way the summer ends: with a bang. The Child’s summer days were divided into two parts: Mornings were spent at driving classes, learning the rules of the road so that next spring, when she turns 16, she will be ready to hit the road in the car she hopes to have. Afternoons were spent at the local pool, teaching youngsters to swim. Summer settled in to a nice rhythm, one that didn’t require much of me. It lasted a few blissful days. The Child calls from a phone number I don’t recognize: her phone – and her bus pass – has been stolen out of her locker at the pool. I drive over to pick her up, and then to the phone store, where I learn a few things. First, once reported as stolen, phones cannot be re-activated, and are effectively useless. Second, you can buy a stolen phone on craigslist for cash; it will seem to work right up to the time it is reported as stolen. From a theoretical standpoint, I have gained an interesting insight into a portion of the economy whose existence I was previously unaware of. From a practical standpoint, the other information I obtain is far more useful: Although I declined insurance coverage when purchasing The Child’s phone, it is, in fact, insured. It is probably the only time I’ve been happy – grateful, even – that my clearly stated preferences were ignored. So, after several more visits to the phone store and various websites, a new phone arrives for The Child. A new bus pass arrives a few days later, to significantly less fanfare. Teenagers don’t get excited about buses; they get excited about cars. Summer resumes its rhythm. The Child begins actual driving lessons, the kind where she gets behind the actual wheel of an actual car and drives on actual roads in actual traffic. She does this with a professional instructor, apparently quite well, and though she’s supposed to practice outside of class, with her parents, she looks for alternate teachers among our neighbors and friends, as do I. She locates a willing parent of a friend, but then that doesn’t work out, and so one warm evening, we head over to the empty parking lot of the nearby community college, and I hand her the key to my car. She drives gingerly up the center lane, and stops at the sign. She makes a left turn into the second parking lot, and remembers to signal. She attempts to park neatly between the white lines, and puts imaginary dents in the cars that aren’t parked there. She circles around the lot, tries again, and fails. I did this really well in my lesson, she says. There were actual cars there and I pulled up between them. This is a bigger car. You have to make a wider turn to line it up. She tries again, drives across the lines again, pulling the car slowly to the concrete stopping block. With a bang and a scraping of metal, the car hurtles abruptly forward, stopping just as suddenly, then quietly whirrs and waits. The Child is crying and hyperventilating, and jumps out of the car, still in Drive, but motionless. I shift it into Park and pull the brake, then get out and walk to the now-vacant driver’s seat to turn off the motor, but the car isn’t going anywhere. It is neatly propped up on the concrete block, which is what stopped it from going down the hill, into the fence and a mass of overgrown blackberry bushes. We spend the rest of the evening sitting on the curb, swatting mosquitos and waiting for the tow truck, which arrives two hours later, hooks the car incorrectly to the winch, and does additional damage to the rear of the car. At least you still have your bus pass, I point out. I’m a good driver at driving school, she says. You just have a bad car. Summers should not be spent like this. Summers should be spent tending the garden, picking blackberries, going to the pool with friends, or riding nowhere in particular on a bike, alone. There should be sand and ice cream and picnics on red-checkered blankets. Summer may mean different things to you, and that’s fine. I’m willing to wager that calls to insurance companies and calls from angry tow truck drivers aren’t on your list, either. Still, I did manage to pick some blackberries this summer, and summer isn’t quite over: there may yet be enough berries to make jam. I also managed to pay just enough attention to my garden that it gave me a gift: some basil, some tomatoes, and one almighty big eggplant. I fear eggplant in much the way that I fear The Child’s driving. The only time I ever ate it as a child was when my mother made eggplant parmesan, which was fortunately not very often. I could not choke it down: the eggplant was bitter, with a slimy texture, then encased in breading and baked under sauce. My mother served it with great pride, when we had guests, but as I got older she stopped having dinner guests and eggplant was something that simply vanished from my existence. When choosing plants for my garden this year, I ran across an eggplant, flowering nicely, and thought: How could anything so pretty produce anything like my awful memory? The answer is, it can’t, if you take proper care of it and cook it well. 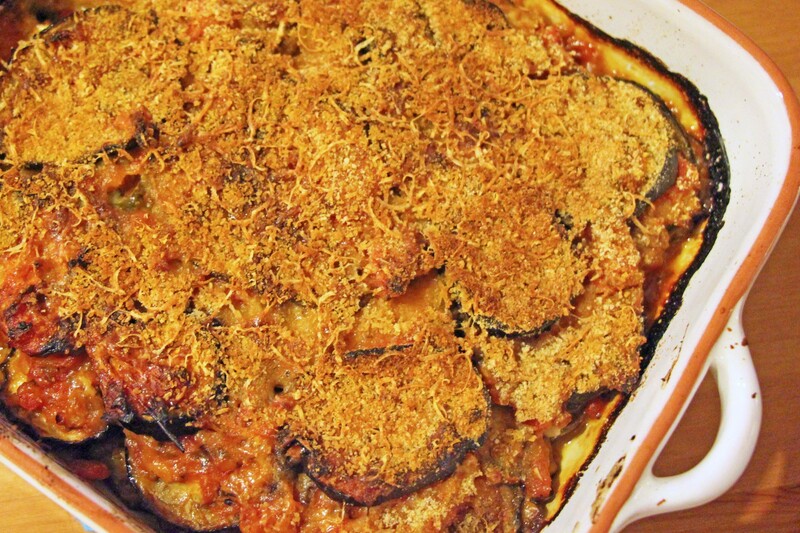 I chose Jamie Oliver’s Eggplant Parmesan Recipe because it seemed to right some of the wrongs of more traditional recipes: the eggplant is roasted in the oven, rather than breaded and fried, then baked in a simple sauce with lots of fresh tomatoes and basil. It was incomparable for dinner. It was superb for lunch the next day. It would make a wonderful sandwich. I used more parmesan cheese than called for in the recipe, because I simply grated a layer of parm onto each layer of sauce and didn’t bother to measure. I also came up a bit short on sauce because I neglected to cover the pan while cooking it, so it cooked down a bit more than it should have. Never mind if you make mistakes; it’s a very forgiving recipe – a last taste of summer, or an early taste of fall. Whichever you prefer.